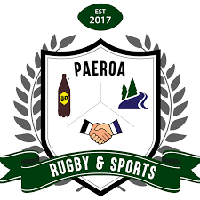 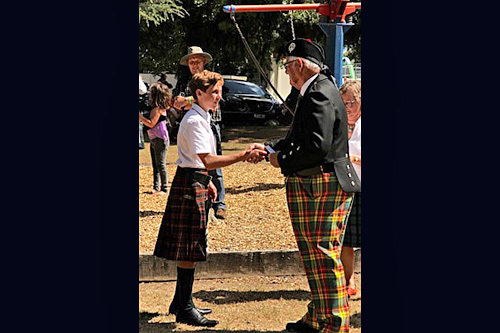 The “O’Hagan Vision Care Paeroa” sponsored Solo Piping Competition will be held in conjunction with the Waikato Pipers Club. 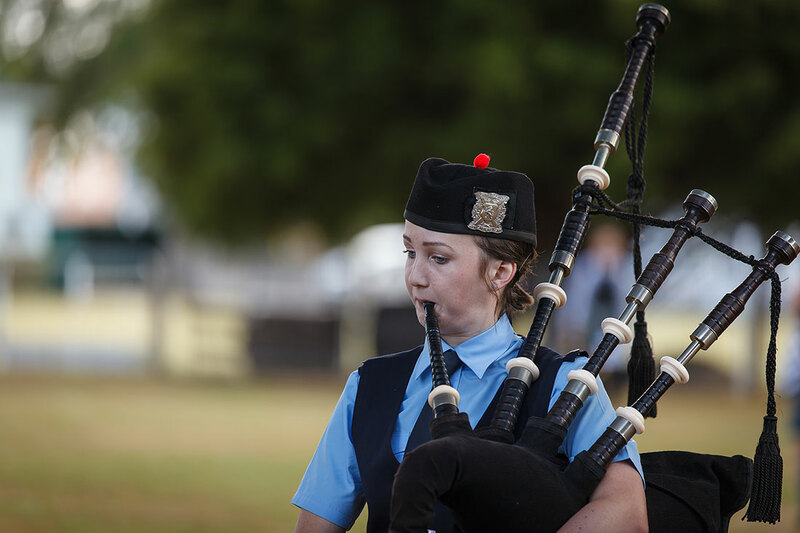 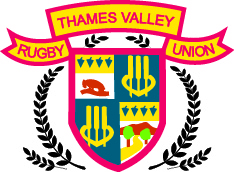 This competition, for grades B, C, D and Novice will be the second part of a four competition series with the competitive best three scores going forward towards their final placings. 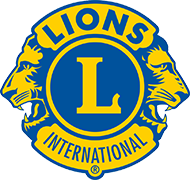 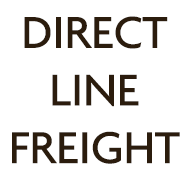 Entry forms will be available from the Secretary or may be downloaded from the Entry Forms page. 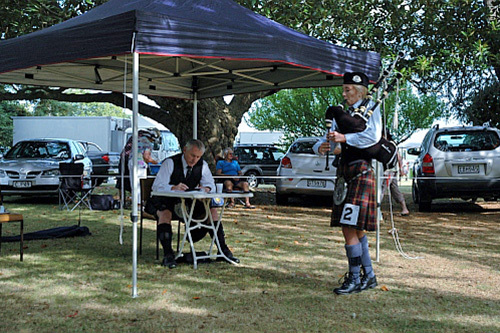 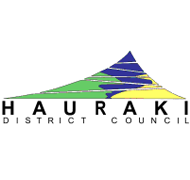 This competition is held under the trees at the southern end of the Paeroa Domain adjacent to the Band Rotunda, and is a must for lovers of Scottish music. 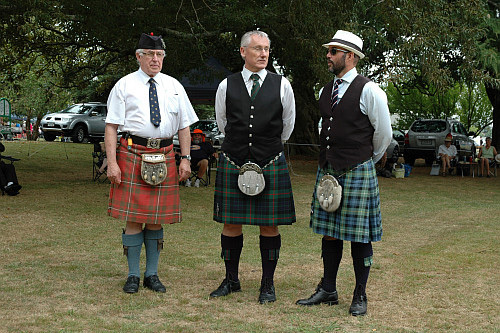 Left to right: Mr Mervyn Appleton, Solo Piping judge; Mr Iain Blakeley, Solo Piping judge and Dr Brendon Eade, Technical Assistant. 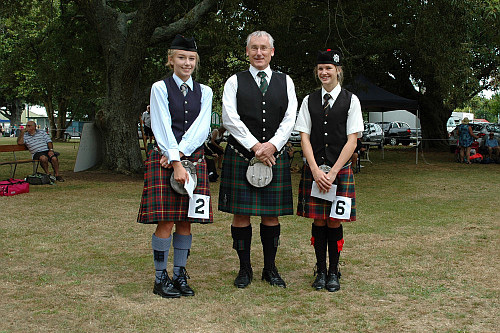 2016 Prize winners B Grade March, Strathspey and Reel, Solo Piping Paeroa. 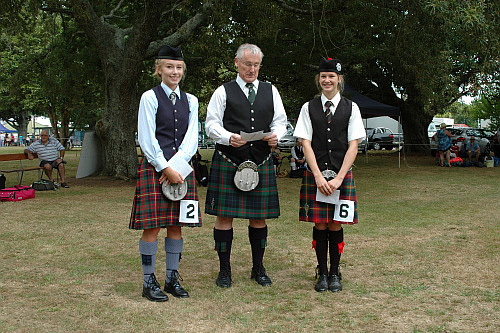 Left to right: Anna Smart 2nd, Mr Iain Blakeley judge, Juliet Johnson 1st. 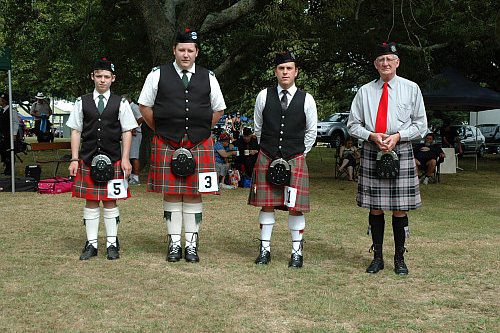 2016 Prize winners C Grade Piobaireachd. 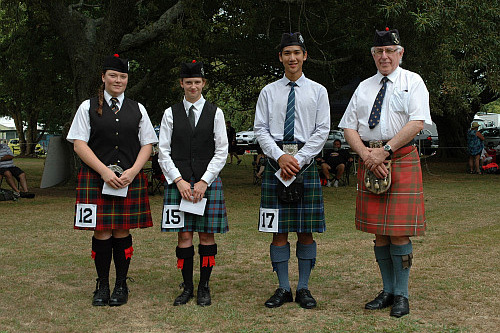 Left to right: Stella Dobbs 3rd, Anita Bentley 2nd, Tim Chia 1st with Mr Mervyn Appleton judge. 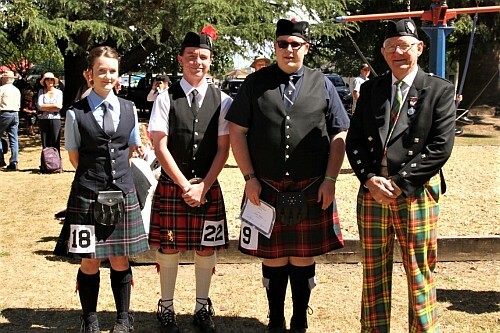 2016 Prize winners C Grade Strathspey and Reel. 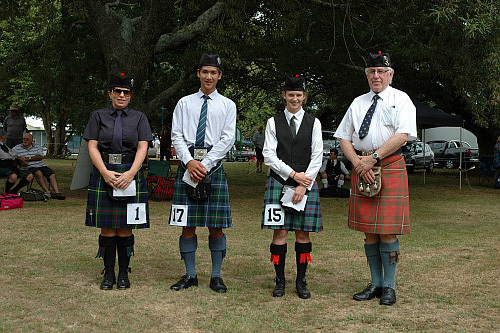 L to r: Lorraine Gow 3rd, Tim Chia 2nd, Anita Bentley 1st with Mr Mervyn Appleton judge. 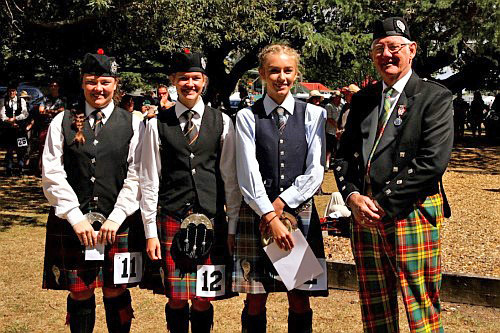 2016 Prize winners C Grade 2/4 March. 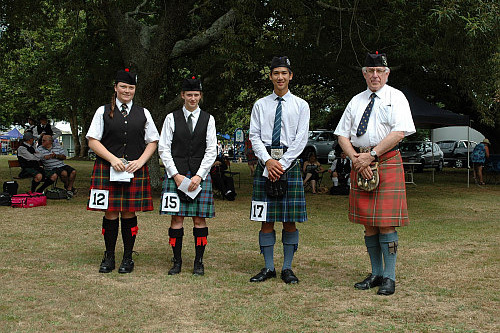 Left to right: Stella Dobbs 3rd, Anita Bentley 2nd, Tim Chia 1st with Mr Mervyn Appleton judge. 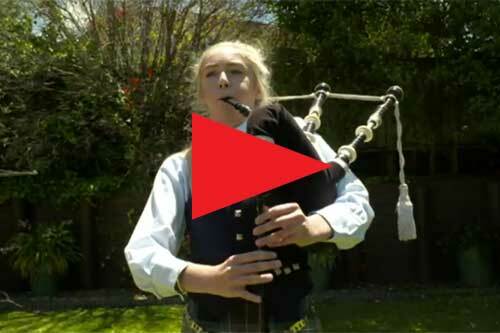 2016 Prize Winners Piobaireachd D Grade. 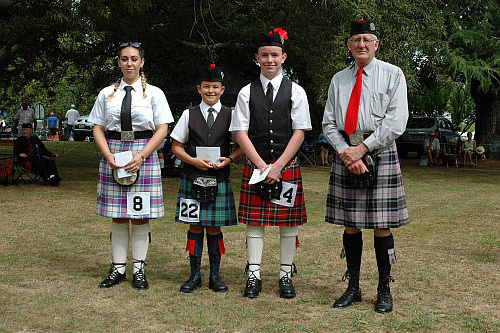 Left to Right: Eden Bowen 3rd, Taine Harvey 2nd, Kevin O’Hara 1st with Mr Bruce Moffett judge and presenter. 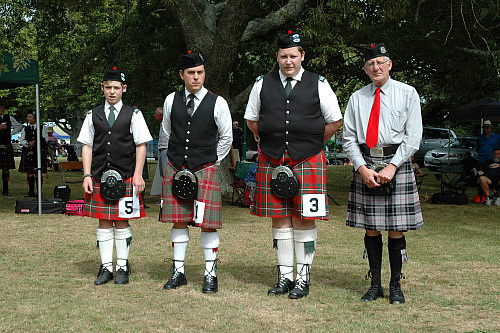 2016 Prize winners D Grade 2/4 March. 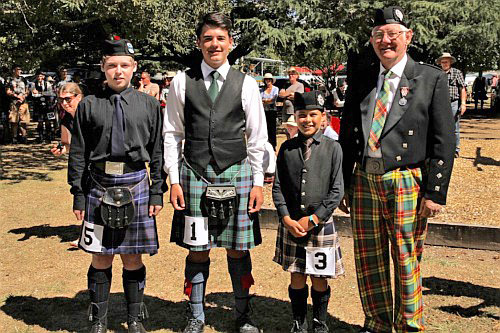 Left to right: Lewis Graham 3rd, Damian Hodgetts 2nd, Gavin Dodd 1st with judge Mr Bruce Moffett. 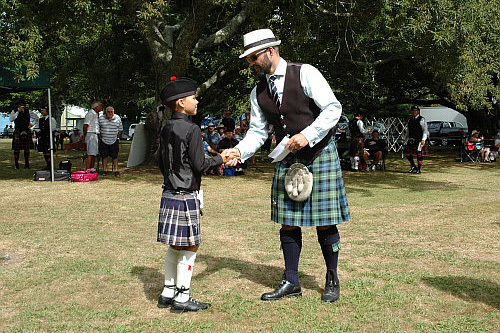 Dr Brendon Eade presenting 1st prize in the Novice Grade March to his son Seumas at the Paeroa Solo Piping competition, February 2016.